A whole-language, meaning-centered easy to implement approach to language learning aligned to natural ways of learning of the child. Language teaching is seen an uphill task and huge efforts go into making children pick up reading and writing in early years. We often miss out on the fact that the child effortlessly taught herself to speak in a natural setting before entering formal schooling. What would it take to replicate that natural way of learning in a language classroom? The long-story curriculum is our answer! What is Qrius Long-story Curriculum? Traditional language textbooks often have many stories and songs which are 'taught', often missing the purpose of using it meaningful language acquisition. What we have created is one story with twists and turns that runs through the academic year. Hence the name long-story. There is a story for each grade level from K-5, written according to the developmental levels and interests of that age group. Here's what it looks like. The story is split into 24 episodes(approximately). And each episode has a 'teacher narrative' and a 'student reading card'. Teacher narrates each episode that ends in a cliffhanger, prompting multiple responses from the class and resulting in a 'learner-generated text'. 'What happens next?' 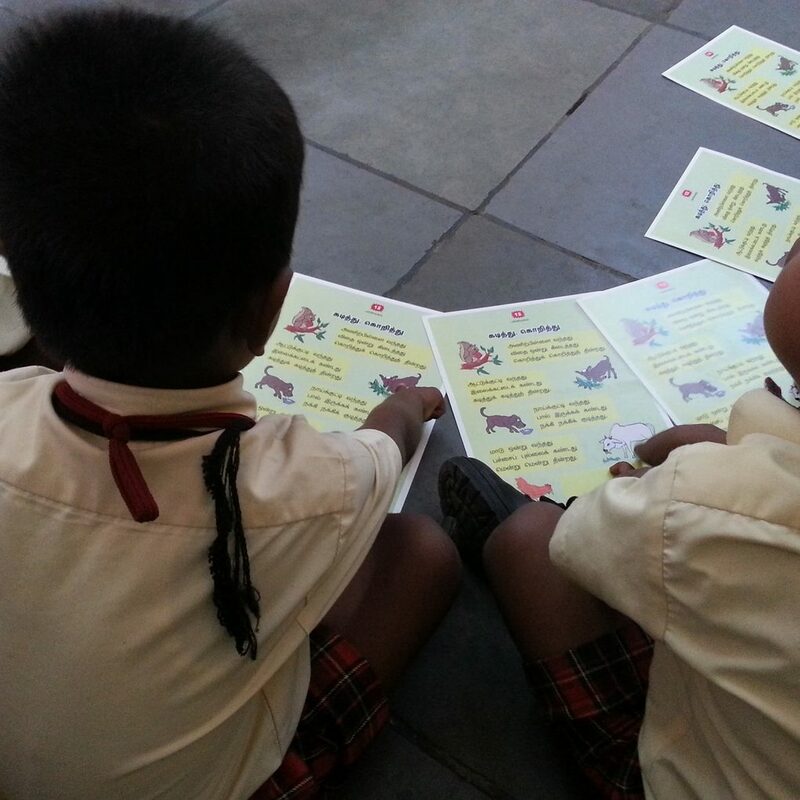 in the story is shared as a reading card to each child. Whole language reading and writing activities are inter-woven into the sub-plots resulting in joyful, child-centered learning! Replicating the natural ways in which a child picks up language in real-life within a classroom set-up is challenging. What the long-story does is create an authentic situation that builds up a need for the child to use language. The social construct of the class, various backgrounds and personal experiences that each child brings in is reflected in the 'learner-generated text' that comes up at each step. This makes the situation as authentic as possible and generates interest in the learning activities that are build around it. As the story proceeds through the academic year, it becomes a roller-coaster ride of emotions and personal experiences the child relates to, strengthening her need to read to figure out what happens next and write to express meaning and emotions. True to the principles of whole-language, the long-story allows for a meaningful, interactive, co-responsive facilitation using the language from the teacher as opposed to a conventional transmission of information and skill-drill about the language(or rules of the language) often seen in classrooms. While we have successfully implemented this approach for native speakers(Tamil being the language), replicating the same for English(as second language) is work underway with pilots and test runs using a bilingual story narrative. The key resource required is the 'long-story' appropriate to the grade level. The material contains the 'Teacher handbook' and 'Student reading cards', both of which combined has the story in it. The 'teacher handbook' serves as a guide instructing the teachers about the classrooms process steps to be followed. For schools that subscribe to the long-story for language instruction, we provide the above mentioned teaching-learning materials.